Through the vagaries of timing and the loss of a meeting I did not present a Chair’s report during July. This was not a reflection that nothing was happening. A number of important issues continue to attract the attention of the Board. The consultation round about the Draft Local Board plan for this term has now been completed. And as can be expected a diversity of views have been offered on a variety of topics. 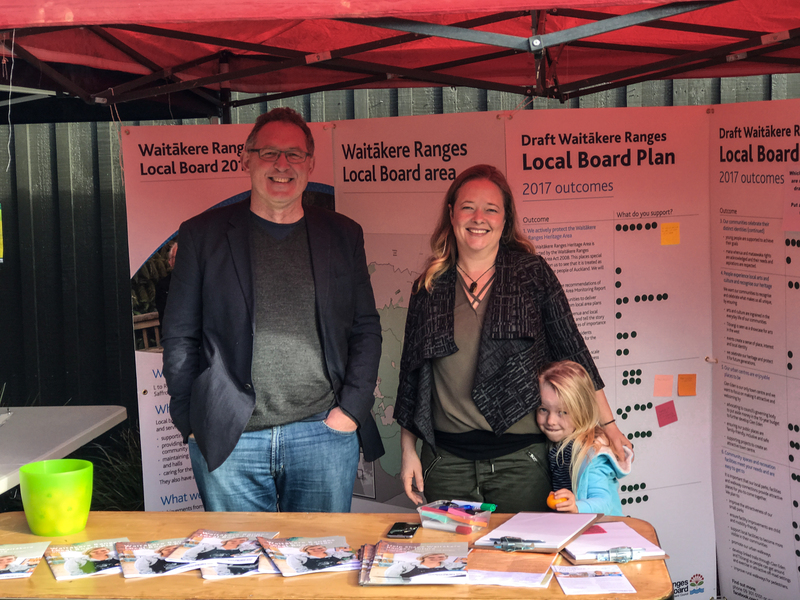 There was a great deal of support for the emphasis in our draft report of the environment and protection of Waitakere Ranges. The concept of stewardship is something that many local residents relate to. Many submitters also supported our plans for Glen Eden and how it needs a good old fashioned spruce up. Others talked about the importance of public transport particularly for those parts of our board area that have little or no access to public transport. The rail system is great and will get even better when the City Rail Link is completed but it is important that we make sure that the links to the local railway stations are of good quality. A number of submissions expressed opposition to the use by Council of glyphosate. The Strategic Weed Plan prepared for the Local Board in 2015 emphasises best practice guidelines that the Method Of Least Disturbance should be used in all natural areas and roadsides under Auckland Council control, to protect desirable vegetation, minimise or prevent weed invasion, and ensure succession to a weed free natural habitat as quickly as possible. There is sympathy for preventing the use of chemical sprays particularly where human exposure is high. The issue is not a simple one however. Some submissions thought that we were paying too much attention to the environment and that people should be higher on the list of priorities. I respectfully disagree with them as I believe a healthy environment is the best thing we can achieve for local people. There was criticism that the plan does not place sufficient emphasis on sport and recreation. I can assure submitters that the area of Sport and Recreation is one of the most important areas the Board is involved in and will continue to be one of our priorities. A number of submissions mentioned walking and cycling. With the limited resources that we have, the Board is doing what we can to accelerate the completion of walkways throughout the area. The Rimutaka walkway is due to be opened shortly. The Board soon will be consulting on the draft Greenways Plan to see what are local priorities for improving the walking and cycling network. Other submissions talked about the housing crisis. This is an issue that is of vital importance to the Board. With our limited budget the most effective thing we can do is to advocate for Council and Central Government to step up to the mark. We have already engaged with major apartment developers in Glen Eden and intend to continue to do this. Other submissions discussed the proposed new Watercare Filter station on Woodlands Park Road. Already this issue has engaged a lot of board time and we intend to continue to be involved and to advocate for local views so that the best results for locals and for the environment can be achieved. One of the most interesting proposals was to physically identify all scheduled trees with a sign. This should be an easy thing to do. In Melbourne not only are they identified but you can also send emails to individual trees. Maybe Auckland Council should think of some sort of register and identifying symbol so that smart phones can pick up and interact with the tree. The submissions are now being considered and the the plan should be finalised in the next couple of months. The public consultation committee is now up and running. The chairperson is Paul Walbran. He was a previous ARC Councillor and has a great deal of experience and expertise and helped oversee the completion of the Manukau sewerage. He was also an ardent supporter of the Waitakere Ranges Heritage Area Act and played a major role in its passing. He has a cooperative style of management and I am sure that he will maximise the effectiveness of the group. At the time of writing this report three meetings have occurred. Watercare has agreed to an independent environmental assessment of the site. I am confident the committee will do its best to ensure that if the new Watercare development happens at Woodland’s Park then the disruption to the environment and to locals are minimised. In particular I hope they can come up with a solution so that Clarks Bush can be preserved and a prominent stand of Kauri on Exhibition Drive can also be preserved. After a frustrating delay Auckland Council has finally released the results of the latest five yearly survey of the presence of Kauri Dieback in the Waitakere Ranges. The news is dire. The Waitakere Ranges has by far the greatest concentration of the disease in the country. Over half of the areas in the Regional Park have trees showing signs of the condition and the rate of infection appears to have doubled since the previous survey was completed five years ago. And it is clear that infection is concentrated around tracks and bait lines. The latter may be the result of infections caused before the use of trigene and hygienic boot cleaning methods became widespread. Everyone that I know who are involved in bait lines are really keen to preserve the Ranges the way they are. But the statistics for use of the trigene stations on the tracks are dire with most people not using the brushes and trigene disinfectant to clean their boots. Drastic measures are being contemplated. I believe that we have to consider the possibility of track closures. A Rahui over the Waitakere Ranges has been proposed by local Iwi and may be needed over at least some of the parkland so that we can at least stabilize things until we understand more fully what is happening and work out a long term containment plan. This is a really difficult conversation to have with local people. We all love the Ranges. We relish use of them. But they are being loved to death. We need to find a sustainable way to interact with them. Starting with how we deal with Kauri dieback. In the medium term an upgrade of the tracks with boardwalks will be required to preserve existing Kauri. There will be a significant cost. But if we want to make sure that the King of the Forest remains we will need to do whatever is required to stop the spread of this most destructive of conditions. I noted earlier the public trial of the use of phosphite which is injected into the trunks of affected trees. Laboratory tests suggest that providing an appropriate dose of phosphite keeps Kauri standing and wards off the effects of the infection, at least in the short term. If any local has an infected Kauri and want to find out more about the trial they can access further information at http://www.kaurirescue.org.nz/. Just a reminder, this is a species threatening condition. No Kauri has yet been discovered to be immune. If nothing is done then we face the prospect of Kauri in the Waitakere Ranges becoming extinct. The board has commissioned a report on coastal and marine water quality. We have two significant problems. The West Auckland lagoons are often polluted. The primary cause is poorly functioning septic tank systems. And on the Manukau Harbour side the beaches are in poor condition with Laingholm and Wood Bay in particularly bad shape. The cause in the Manukau is a combination of ovarian and dog faeces and leaking infrastructure. Dogs and birds have had some effect but human faeces and the local infrastructure has been implicated. We are going to urge Watercare to get on top of this problem. The report will be released soon and we intend to talk to local communities about the results and about what we do next. Under the Act Auckland Council is supposed to prepare a report on the current health of the Heritage Area every five years. The report is there to highlight trends and to sound warnings. If there are changes happening then the report should drive Council activity. The first report was prepared in 2013 and indicated overall that the Act was working the way it was intended. The second report is due for completion next year. Hopefully the result will be the same. But the report is an important one and something that the Board takes seriously. The Local Board has launched the Glen Eden Business Prospectus. The intent is to persuade prospective business owners that Glen Eden is a great place to do business in. Clearly Glen Eden is facing dramatic change. Currently the Ted Manson apartment blocks are being constructed, a Housing Corporation building will follow and there is a private apartment block currently in the design stage. Intensification is occurring. It is important that it is done correctly. The City Rail Link is also being constructed and is due for completion in 2023. It will be transformational. Being able to get to the middle of town within 30 minutes will persuade many people that Glen Eden is a cool place to live in and work in. The Local Board though the efforts of Steve Tollestrup has prepared a business prospectus to be made available to real estate agents and anyone showing an interest in setting up business here. The prospectus highlights some of the thriving and interesting business that we have in our area. Businesses like Fiesta Cafe run by Nikki Price and Korean Sushi are setting the standard for quality cuisine. Right here in Glen Eden. To handle the growth there needs to be urban transformation. Currently our primary commercial area resembles a large car park To make it a more attractive place for people the local board is investigating designing and funding of a town square in the centre of the commercial area. The hope is that by improving this part of Glen Eden it will have a transformative effect and persuade current building owners of some rather tired buildings to refurbish or rebuild. Glen Eden will have a great future. The Local Board is doing its best to make sure that this happens. I was pleased to be invited to speak at Laurie Ross’s peace event at Titirangi Library. The topic of the meeting was our nuclear free status 30 years on from the passing of the Nuclear Free legislation. Preparing the speech made me reflect on how brave the Government was back then in saying no to the Americans and refusing to allow American Nuclear ships to visit New Zealand. The feeling at the time was that nuclear war was almost inevitable. Thankfully this did not happen and in our own small but significant way New Zealand made the world a safer place to be in by saying that reliance on nuclear weapons for safety was wrong. Who can forget the Oxford Union debate when David Lange said that he could smell uranium on the breath of an over eager young man who tried to suggest that New Zealand was still snuggling up to the bomb? Or his description of the insanity of the nuclear arms race in that all that was happening was that both sides were refining an existing capacity to make the rubble bounce and bounce. Waitakere City has had a proud history of being a Peace area. The Local Board intends to continue this proud heritage. This was organised by the Love Titirangi group. The goal is to persuade as many people as possible to forgo the use of plastic bags. The reason? Our environment is slowly suffocating from the use of plastics and every source should be avoided. They are found in the digestive tracts of birds and large fish including whales, and plastics are forming a larger and larger area of our ocean. There is no planet B. We trash this planet at our peril. The event itself was a great occasion involving the Mayor, a cast of thousands, music, bag making and the handing out of free reusable bags to the crowd. Young people played a prominent part and the local schools are clearly onside. Congratulations to Love Titirangi and to Ecomatters Trust for starting this program and for raising this very important issue.